The sequel to Amie Kaufman and Jay Kristoff's Illuminae and Gemina is not coming any sooner than anticipated. Lucky for us we do have here the official cover for Obsidio, the third book in the The Illuminae Files series, to satiate that longing. If you are not still satisfied, you insatiable soul, head over to EW to read some Obsidio excerpts. In this generation, where almost every story feels repetitive and derivative, some authors try breakout from this stereotypes and bring us something fresh, something just like the authors gave us here in this series - telling the story through redacted official documents, emails, etc. The books is to be released next year, and this will the longest that we have to wait, considering the previous two books were released one year apart (every October) and this one will have an extra six months to control our wandering and anxious minds. I don't mind the extra months since this is the closing chapter in the series and we all need a satisfying ending! 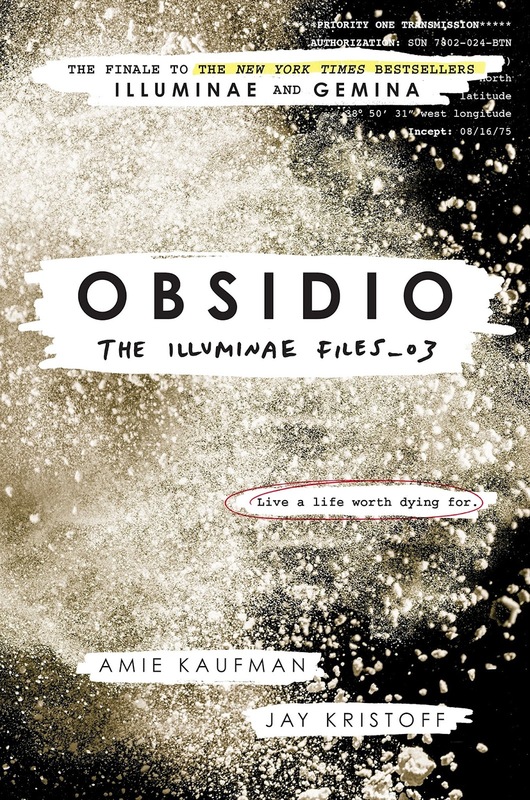 Check out the cover of The Illuminae Files 03: Obsidio by Amie Kaufman and Jay Kristoff. From bestselling author duo Amie Kaufman and Jay Kristoff comes the exciting finale in the trilogy that broke the mold and has been called "stylistically mesmerizing" and "out-of-this-world-awesome." Kady, Ezra, Hanna, and Nik narrowly escaped with their lives from the attacks on Heimdall station and now find themselves crammed with 2,000 refugees on the container ship, Mao. With the jump station destroyed and their resources scarce, the only option is to return to Kerenza--but who knows what they'll find seven months after the invasion? Meanwhile, Kady's cousin, Asha, survived the initial BeiTech assault and has joined Kerenza's ragtag underground resistance. When Rhys--an old flame from Asha's past--reappears on Kerenza, the two find themselves on opposite sides of the conflict. With time running out, a final battle will be waged on land and in space, heros will fall, and hearts will be broken. The Illuminae Files 03: Obsidio by Amie Kaufman and Jay Kristoff will be released on March 13, 2018.